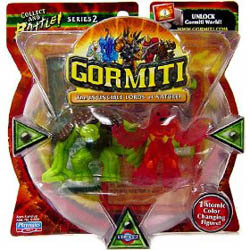 Six different tribes (Earth, Water, Forest, Volcano/Magma and Volcano/Lava) exist in the Gormiti world to collect. Each tribe has its own lord who is determined to control the island of Gorm. New power, new atomic lords, new champions. Action figures and cards.